On Oct. 19, the 2010 promotion boards for sergeant major, master gunnery sergeant, first sergeant and master sergeant kick off. They’re important panels that will decide who will become the Marine Corps’ senior-most Marines — and by default, who may be forced to retire. 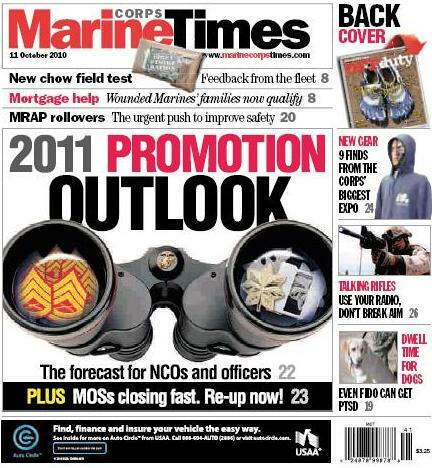 With that in mind, Marine Corps Times rolls out this week its 2011 promotion outlook, assessing the odds that all Marines going before 2010 boards in the next year face. That’s of particular interest to sergeants and staff sergeants going before some of their first promotin boards as a Marine, but also for junior Marines who likely will face similar odds in coming years and first lieutenants who face career designation boards that could bump them to the Selected Marine Corps Reserve, whether they like it or not. Lt. Gen. Richard Zilmer, deputy commandant of manpower & reserve affairs, makes several predictions for Marines in the story. As a companion piece, Marine Corps Times also shares the first 50-plus military occupational specialties expected to close to 2011 first-term reenlistment in the next few weeks. One hint to consider: More than 50 percent of all 2011 slots already committed to Marines who submitted in reenlistment packages.